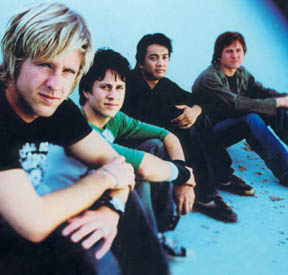 Switchfoot is an aweosome christian rock band that started out as brothers Jon and Tim Foreman and Chad Butler. They are from San Diego Califorina and they like to surf, that's where the name Switchfoot comes from, i'ts a surfing term that is used when a surfer does a 180 degree turn on a board to gain a new perspective. A while back I read a TS Elliot poem called The Hollow Men. The imagery in the poem continues to haunt me: we are the hollow men/ we are the stuffed men... I look at our planet and I see a horrible, beautiful world... where love and hate breathe the same air. This is where we wake up everyday; this is where we live. Maybe the kid in the song is me, hoping that Im bent for more than arguments and failed attempts to fly. Something deep inside of me yearns for the beautiful, the true. I want more than what Ive been sold; I want to live life. Music holds her cards close to her chest; she always maintains the element of mystery. Sometimes everything feels so right and you cant explain why. This album felt that way for us. We only spent around two weeks in the studio but I wouldnt have spent another minute. This tune is a good example of the mystery of sound. We started messing around at my house with different low-end synths and lo-fi beats and this mellow acoustic song became transformed. Im not quite sure how we got here but Im glad that the song arrived. I flew out to South Beach in Florida, (where Tom Lord-Alges studio is) to be a part of the mixing process for this track. We could only afford one ticket so I went solo. Stayed at a funky hotel a few blocks from the beach, delirious from red eye flying (and a crazy conversation with the cab driver), watching a guy Ive never met mix our song. I remember thinking, This is crazy. This is my life!? Sometimes the simplest questions are the hardest to answer; kind of like the way the night sky can still shake me up. I spent much of my childhood watching surf videos, fixing dings, and looking for waves. Taylor Steeles videos were always supercharged with a punk rock soundtrack that would fuel your next surf, becoming the background music of my high school years. Several of the short-lived garage bands that I was in wanted to play only punk covers. But I never really wanted to be punk rock; I just liked the energy in the music. I think part of what attracted me to bands like Op Ivy and Minor Threat was their commitment to change. But so much of what I hear today is content with things the way they are. I feel like contentment can be a dangerous thing in the wrong hands. Now is the time to change. If punk is dead (and Im not talking about whether it sells! ), maybe this is a punk tune disguised as pop. Einstein said, Without belief in the inner harmony of the world there would be no science. Maybe. I say without the dissonance of our modern age there would be no rock and roll. There lies the tension: between the harmony and the dissonance. Were the problem, were the issue. I can pin the blame on whomever I want but the mirror still points my direction. This is a tune that really feels great to play live: step on a distortion pedal and scream about the dissonance. I love to write songs; Ive been at it since I could reach the piano. Its one of my favorite ways to pass the time. Music helps me sort out who I am so my songs usually end up being somewhat autobiographical. Ive always felt the deepest connection with honest songs so I try to write with sincerity. This song is an attempt to honestly face the gap between who I am and who I want to be; between the way the world spins and the way it should be. Ive heard that we only use a small part of our brain. Maybe our soul is the same way. And maybe were half asleep most of our lives, simply reacting to the stimulus our brain receives. Action, true action is rare indeed. 4 AM is a great time of night. The day before is long dead but the morning is yet to come. All the commotion from the night before has died down and every sane upstanding citizen is asleep. Its a great time to go for a walk. Youve got the planet to yourself for an hour or so, so peaceful... even the stars look different: waiting for the dawn. I feel the same way that the stars do sometimes. Anticipating... the night is nearly over, the day is almost here. Physics tells us that everything on this planet will fail us eventually. Trust someone, fall in love: your scars will tell the same story. Entropy, pain, beauty, love, hope... mix them together and call it living. The choice that remains is where we go to find meaning and truth. The biggest failures and disappointments in my life have led me to look beyond what money or power or friends can buy. When youre face down at the very bottom of who you are, and there is no formality or pretence to cling to, all your masks fall off. In this broken place, our lives can be seen for what they are, no more no less; we are ourselves. The question is this: What happens after the twin towers in our lives fall? Do we become bitter and hateful or does redemption come into focus? Ive been on both sides...only one is beautiful. When were not on the road, we spend a lot of time working on the next batch. After the song is written, we try and figure it out: fooling around with different arrangements, different sounds... messing around with electricity so to speak. The voice at the beginning of the song is off of my answering machine, (which by the way, can be a great thing to record; I record my answering machine often) We chopped up the message and threw it in. Actually, come to think of it, I dont think my friend has heard the tune yet! Anyways, to sum up what the song is about: its a fun, catchy tune about how were all going to die someday! Life is so short, live well. Daniel Heavenward, a friend of mine from Canada, came out to California and stayed at my place for a day. We went out for pizza, wrote a couple Remy Zero-ish songs, and called it a night. In the morning, about an hour before I was going to drop him off at the train station, this song flew out. We threw it down, I burned a CD for Dan and we raced to the station. This song is so personal- it feels great to play live. On a good night, I feel like I can just throw myself into this song and drift off over the crowd through the PA. I wrote this song near the end of my 24th year on this planet. Wherever we run, wherever the sun finds us when he rises, we remain stuck with ourselves. That can be overwhelming. Sometimes I feel like my soul is polluted with politicians, each with a different point of view. With all 24 of them in disagreement, each voice is yelling to be heard. And so I am divided against myself. I feel that I am a hypocrite until I am one, when all of the yelling inside of me dies down. Ive heard that the truth will set you free. Thats what Im living for: freedom of spirit. I find unity and peace in none of the diversions that this world offers. But Ive seen glimpses of truth and thats where I want to run. Does Lewis or Tolkien mention Christ in any of their fictional series? What is more Christ-like, feeding the poor, making furniture, cleaning bathrooms, or painting a sunset? There is a schism between the sacred and the secular in all of our modern minds. The view that a pastor is more Christian than a girls volleyball coach is flawed and heretical. The stance that a worship leader is more spiritual than a janitor is condescending and flawed. These different callings and purposes further demonstrate Gods sovereignty. Many songs are worthy of being written. Switchfoot will write some, Keith Green, Bach, and perhaps yourself have written others. Some of these songs are about redemption, others about the sunrise, others about nothing in particular: written for the simple joy of music. None of these songs has been born again, and to that end there is no such thing as Christian music. My life will be judged by my obedience not my ability to confine my lyrics to this box or that. We all have a different calling; Switchfoot is trying to be obedient to who we are called to be. Were not trying to be Audio A or U2 or POD or Bach: were trying to be Switchfoot. You see, a song that has the words: Jesus Christ is no more or less Christian than an instrumental piece. (I've heard lot's of people say jesus christ and they weren't talking about their redeemer.) You see, Jesus didnt die for any of my tunes. So there is no hierarchy of life or songs or occupation only obedience. We have a call to take up our cross and follow. We can be sure that these roads will be different for all of us. Just as you have one body and every part has a different function, so in Christ we who are many form one body and each of us belongs to all the others. Please be slow to judge brothers who have a different calling and thank you for reading"